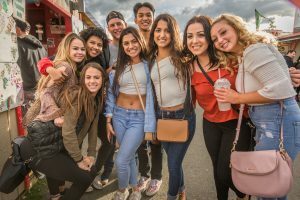 The Alaska State Fair invites Alaska high school students to apply for a 2019 Fair scholarship. The Fair will award $6,000 in scholarships to five students this year. The application deadline is Tuesday, April 2, 2019 at 4:30 p.m. Scholarships include $2,500 for first place, $1,500 for second place, $1,000 for third place, and two honorable mentions of $500 each. Every student who submits a completed application will also receive two free admissions to the 2019 Fair. All Alaska junior and senior high school students who plan to attend college or vocational school are eligible to apply. Students who applied last year should prepare a new application, as re-submissions from the previous year will be disqualified. Ideas submitted become the property of the Alaska State Fair. We’re no longer accepting scholarship applications.